For over a decade, Columbus has been lucky enough to periodically play host to internationally acclaimed percussionist Tatsuya Nakatani (photo by Peter Gannushkin) in a variety of modes through the good graces of little-sung booking hero Gerard Cox. His show on Wednesday, September 30th, at north campus multipurpose art space Wild Goose Creative (2491 Summit St) promises to be very special. It features Nakatani in duo with one of Columbus’ finest jazz musicians, Hasan Abdur-Razzaq, with Sonikora, a new trio dedicated to improvisational music that grew out of Columbus jam band Hubbard Stew, opening. The show is scheduled for 9-11:30pm (UPDATED), for more info please consult the Facebook event. Continue reading for more info on the musicians playing and videos. 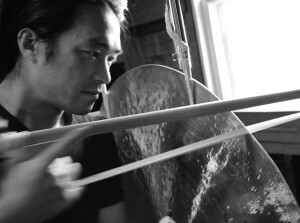 Nakatani is one of the most prolific and diverse percussionists in contemporary improvised music. He works in a variety of modes from solo to leading the Nakatani Gong Orchestra (an ensemble of varying members all playing bowed gongs) to collaborations with a who’s who of the finest improvisers of the last 30 years. His restless creativity and search for new sounds never panders to trends, novelty, or the flavor of the week. He sculpts sounds through percussive means and in doing so creates whole worlds the listener can be lost in and dazzled by. His intensity is rivaled only by his commitment to truth and deep emotional content. As much as I enjoy Nakatani’s work with long tones and meditative space, my favorite music he’s done also makes room for a deep groove. That’s what I think is so special about this show judging by the lineups on this tour. Hasan Abdur-Razzaq came out of the Cleveland free jazz scene in the ’60s that most famously gave the world Albert and Donald Ayler and cellist Abdul Wadud. He carries that torch proudly and boldly deep into the 21st century, territory that can be skeptical and unforgiving of music that has a spiritual or knowledge component. Many people still play that kind of fire music free jazz but very, very few people do it with the finesse, the melodic sense, and the depth of feeling Abdur-Razzaq brings with him every time he picks up his horn. These two deeply conscious stylists and truth-tellers should bring out the best in both of them and maybe even in those of us lucky enough to be in the audience.